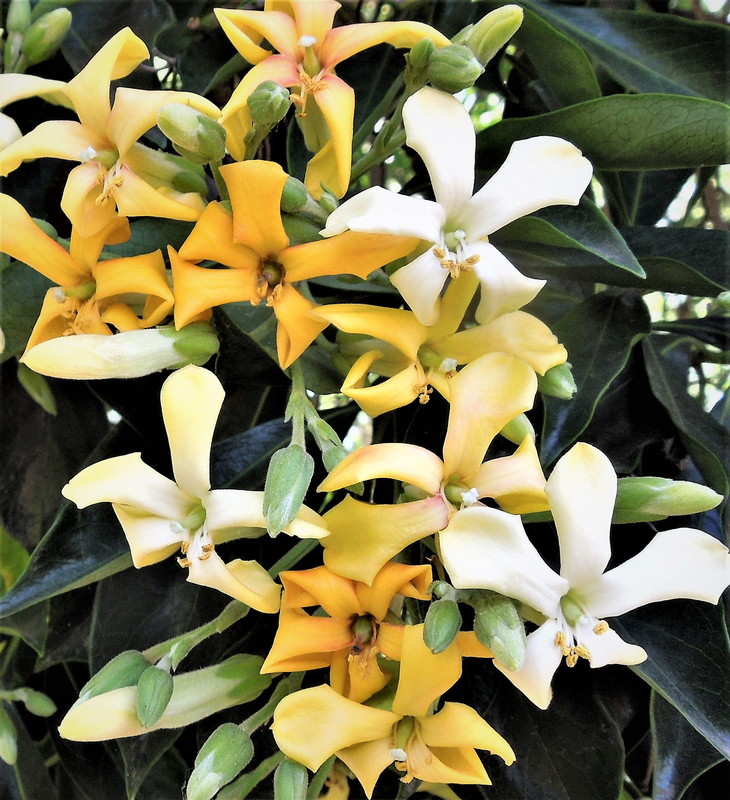 The amazingly sweet perfume that drifts from the flowers of the Sweetshade Tree – a divine combination of Plumeria and orange blossom – gives this lovely tree its name. Its branches bear a spectacular profusion of blooms, in bouquet clusters of up to 16 flowers, from March through May in our area. As the flowers age, their color changes from a creamy yellow, to a warm honey, and then to a dark gold. The Sweetshade Tree makes a wonderful addition to the garden. It often has a distinctively open, asymmetrical shape, but with pruning can easily be maintained to have a tidy form that fits into any sized garden. It grows to 25-30 feet high, but only 15-20 feet wide, erect and slender, so it fits well into narrow spaces. Branches are widely-spaced and occur in whorls radiating out from the trunk. It is an evergreen tree – so, when not in bloom, shiny bright-green leaves make it attractive year-round. Its light-grey bark, flaking in small spots to reveal a cinnamon-brown inner bark, contrasts well with the lustrous foliage. It does prefer full sun but can do well in partial shade. It is surprisingly drought tolerant but does much better with infrequent deep watering and with well-drained soil. It is cold hardy to at least 20 degrees. The botanical name of the Sweetshade Tree is Hymenosporum flavum. The genus name is derived from the Greek words ‘hymen’, meaning membrane, and ‘spora’, meaning seed, referring to its winged seeds. The specific epithet name is from the Latin word ‘flavus’, meaning yellow, referring to the flower color. It is a member of the family Pittosporaceae, which includes the much more common species, Pittosporum. 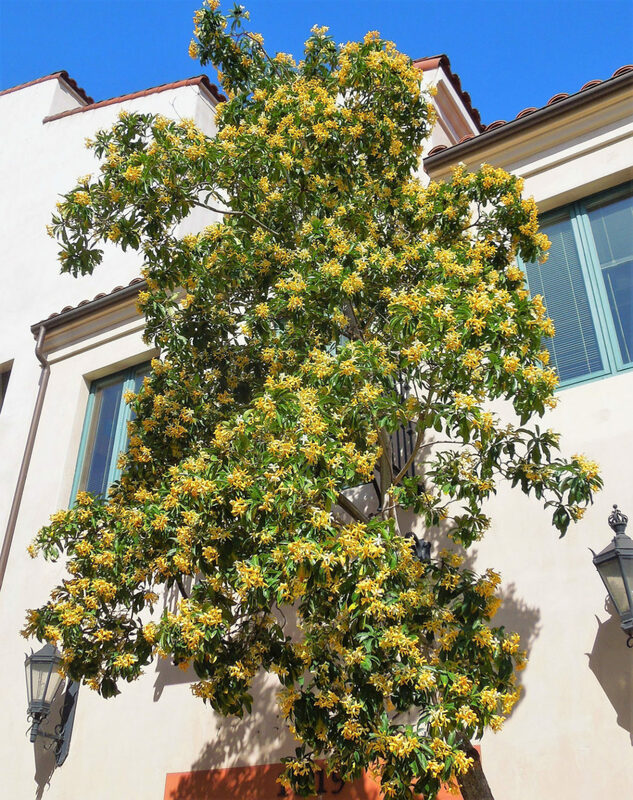 A native of Australia, the Sweetshade Tree has been a popular and widely planted landscape tree in Santa Barbara since it was introduced here in 1900 by Dr. Franceschi, one of our significant early local horticulturists. In fact, the largest recorded Sweetshade Tree in California is a street tree located on Dibblee Avenue in Santa Barbara which was planted in 1904 and is still beautiful today. More examples of Sweetshade Trees can be seen in Alice Keck Park Memorial Gardens, along the 1400-1600 blocks of Garden Street, on De La Vina Street at Mission Street, and on Anacapa Street near Anapamu Street.